« Make sure to start with eggs that are room temperature. I know most of us have been taught to whisk our eggs until the cows come home, but that ends up breaking down the egg, which can lead to stringy scrambled eggs. So don’t pre-whisk! « …keep the pan on the lowest setting. These eggs will take longer than you want them to take to finish, but OMG they’re so creamy and perfect! Just keep the heat on low, and stir the eggs in a figure-8 pattern with the spatula. Take them off the heat, just 30-45 seconds before they’re finished, as they will continue to cook when you take them off of the heat. This is a bit confusing, as she says not to stir your eggs before putting them in the pan – but in the picture the eggs have clearly been stirred before they go in the pan. Hi Jessica! Don’t pre-whisk! I removed that pesky whisk photo that was definitely confusing. Sorry I didn’t catch sooner! Depuis quelque temps, certains articles ne sont publiés qu’en anglais : dommage ! Je me faisais également une joie de lire l’article mais toujours pas de français disponible. Même soucis sur l’article lingerie qui reprend en anglais en plein milieu. I love Sophia’s approach on food and cooking so much. We share the same recipie for scrambled eggs and I agree with her: it takes some patience, but they are the best cooked like this. Preparing them is a little meditation in its own: you have to take it slow, be focused and careful. According to the picture Sophia pre-whisked the egg before adding to the pan, the text says not to pre-whisk. So, pre-whisk, or not? Still searching for the perfect recipe! I love scrambled eggs! 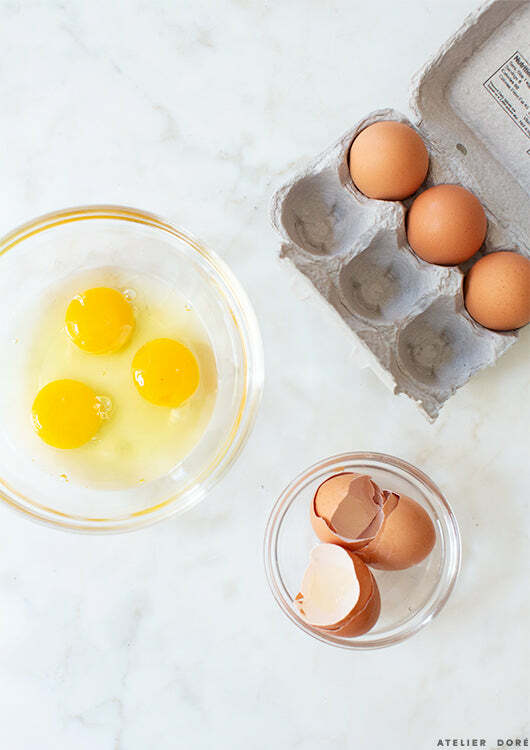 This method does make a softer and creamier scrambled egg – I just tried! Thank you for posting. Love the jumpsuit. Where can we get them? I love this jumpsuit, where is it from? All seems easy and naturel! Do you have raw recipes too?